ToolChain - Access to tools for a single platform. Definition at line 88 of file ToolChain.h. Definition at line 90 of file ToolChain.h. Definition at line 92 of file ToolChain.h. Definition at line 113 of file ToolChain.h. Definition at line 108 of file ToolChain.h. Definition at line 97 of file ToolChain.h. Definition at line 102 of file ToolChain.h. Definition at line 72 of file ToolChain.cpp. References getArchSpecificLibPath(), getFilePaths(), getLibraryPaths(), clang::driver::Driver::getTargetTriple(), getVFS(), P, and clang::driver::Driver::ResourceDir. AddCCKextLibArgs - Add the system specific linker arguments to use for kernel extensions (Darwin-specific). Definition at line 833 of file ToolChain.cpp. AddClangCXXStdlibIncludeArgs - Add the clang -cc1 level arguments to set the include paths to use for the given C++ standard library type. Reimplemented in clang::driver::toolchains::DarwinClang, clang::driver::toolchains::Generic_GCC, clang::driver::toolchains::CudaToolChain, clang::driver::toolchains::MSVCToolChain, clang::driver::toolchains::HIPToolChain, clang::driver::toolchains::Fuchsia, clang::driver::toolchains::MinGW, clang::driver::toolchains::XCoreToolChain, clang::driver::toolchains::CrossWindowsToolChain, and clang::driver::toolchains::BareMetal. Definition at line 785 of file ToolChain.cpp. Referenced by clang::driver::toolchains::HIPToolChain::AddClangCXXStdlibIncludeArgs(), clang::driver::toolchains::CudaToolChain::AddClangCXXStdlibIncludeArgs(), clang::driver::toolchains::DarwinClang::AddClangCXXStdlibIncludeArgs(), and RelocationModelName(). Add the clang cc1 arguments for system include paths. This routine is responsible for adding the necessary cc1 arguments to include headers from standard system header directories. Reimplemented in clang::driver::toolchains::CudaToolChain, clang::driver::toolchains::MSVCToolChain, clang::driver::toolchains::HIPToolChain, clang::driver::toolchains::Fuchsia, clang::driver::toolchains::HexagonToolChain, clang::driver::toolchains::MyriadToolChain, clang::driver::toolchains::MinGW, clang::driver::toolchains::CrossWindowsToolChain, clang::driver::toolchains::XCoreToolChain, clang::driver::toolchains::Solaris, clang::driver::toolchains::NaClToolChain, clang::driver::toolchains::BareMetal, clang::driver::toolchains::MSP430ToolChain, clang::driver::toolchains::RISCVToolChain, clang::driver::toolchains::MipsLLVMToolChain, clang::driver::toolchains::Hurd, and clang::driver::toolchains::Linux. Definition at line 663 of file ToolChain.cpp. Referenced by clang::driver::toolchains::HIPToolChain::AddClangSystemIncludeArgs(), clang::driver::toolchains::CudaToolChain::AddClangSystemIncludeArgs(), and RelocationModelName(). Add options that need to be passed to cc1 for this target. Reimplemented in clang::driver::toolchains::Darwin, clang::driver::toolchains::Generic_ELF, clang::driver::toolchains::CudaToolChain, clang::driver::toolchains::HIPToolChain, clang::driver::toolchains::NetBSD, clang::driver::toolchains::Fuchsia, clang::driver::toolchains::HexagonToolChain, clang::driver::toolchains::XCoreToolChain, clang::driver::toolchains::AMDGPUToolChain, clang::driver::toolchains::BareMetal, clang::driver::toolchains::MSP430ToolChain, and clang::driver::toolchains::RISCVToolChain. Definition at line 668 of file ToolChain.cpp. Referenced by clang::driver::toolchains::HIPToolChain::addClangTargetOptions(), and clang::driver::toolchains::CudaToolChain::addClangTargetOptions(). Add warning options that need to be passed to cc1 for this target. Reimplemented in clang::driver::toolchains::DarwinClang, clang::driver::toolchains::CudaToolChain, and clang::driver::toolchains::HIPToolChain. Definition at line 672 of file ToolChain.cpp. Referenced by clang::driver::toolchains::HIPToolChain::addClangWarningOptions(), and clang::driver::toolchains::CudaToolChain::addClangWarningOptions(). Add arguments to use system-specific CUDA includes. Reimplemented in clang::driver::toolchains::Darwin, clang::driver::toolchains::CudaToolChain, clang::driver::toolchains::MSVCToolChain, clang::driver::toolchains::MinGW, and clang::driver::toolchains::Linux. Definition at line 886 of file ToolChain.cpp. AddCXXStdlibLibArgs - Add the system specific linker arguments to use for the given C++ standard library type. Reimplemented in clang::driver::toolchains::DarwinClang, clang::driver::toolchains::Fuchsia, clang::driver::toolchains::XCoreToolChain, clang::driver::toolchains::CrossWindowsToolChain, clang::driver::toolchains::OpenBSD, clang::driver::toolchains::FreeBSD, clang::driver::toolchains::NaClToolChain, clang::driver::toolchains::BareMetal, clang::driver::toolchains::CloudABI, and clang::driver::toolchains::MipsLLVMToolChain. Definition at line 805 of file ToolChain.cpp. References CST_Libcxx, CST_Libstdcxx, and GetCXXStdlibType(). Referenced by collectSanitizerRuntimes(), constructHexagonLinkArgs(), clang::driver::tools::wasm::Linker::ConstructJob(), clang::driver::tools::cloudabi::Linker::ConstructJob(), clang::driver::tools::MinGW::Linker::ConstructJob(), clang::driver::tools::netbsd::Linker::ConstructJob(), clang::driver::tools::ananas::Linker::ConstructJob(), clang::driver::tools::RISCV::Linker::ConstructJob(), and clang::driver::tools::gnutools::Linker::ConstructJob(). Utility function to add a system include directory with extern "C" semantics to CC1 arguments. Note that this should be used rarely, and only for directories that historically and for legacy reasons are treated as having implicit extern "C" semantics. These semantics are ignored by and large today, but its important to preserve the preprocessor changes resulting from the classification. Definition at line 761 of file ToolChain.cpp. Referenced by clang::driver::toolchains::Hurd::AddClangSystemIncludeArgs(), clang::driver::toolchains::Linux::AddClangSystemIncludeArgs(), clang::driver::toolchains::Solaris::AddClangSystemIncludeArgs(), clang::driver::toolchains::CrossWindowsToolChain::AddClangSystemIncludeArgs(), clang::driver::toolchains::HexagonToolChain::AddClangSystemIncludeArgs(), clang::driver::toolchains::Fuchsia::AddClangSystemIncludeArgs(), and addExternCSystemIncludeIfExists(). Definition at line 768 of file ToolChain.cpp. AddFastMathRuntimeIfAvailable - If a runtime library exists that sets global flags for unsafe floating point math, add it and return true. This checks for presence of the -Ofast, -ffast-math or -funsafe-math flags. Definition at line 838 of file ToolChain.cpp. Referenced by clang::driver::tools::MinGW::Linker::ConstructJob(), and clang::driver::tools::gnutools::Linker::ConstructJob(). AddFilePathLibArgs - Add each thing in getFilePaths() as a "-L" option. Definition at line 822 of file ToolChain.cpp. Referenced by ConstructGoldLinkJob(), clang::driver::tools::wasm::Linker::ConstructJob(), clang::driver::tools::fuchsia::Linker::ConstructJob(), clang::driver::tools::cloudabi::Linker::ConstructJob(), clang::driver::tools::nacltools::Linker::ConstructJob(), clang::driver::tools::MinGW::Linker::ConstructJob(), clang::driver::tools::openbsd::Linker::ConstructJob(), clang::driver::tools::ananas::Linker::ConstructJob(), clang::driver::tools::freebsd::Linker::ConstructJob(), clang::driver::tools::RISCV::Linker::ConstructJob(), clang::driver::tools::msp430::Linker::ConstructJob(), and clang::driver::tools::gnutools::Linker::ConstructJob(). Add arguments to use MCU GCC toolchain includes. Reimplemented in clang::driver::toolchains::CudaToolChain, clang::driver::toolchains::HIPToolChain, and clang::driver::toolchains::Linux. Definition at line 889 of file ToolChain.cpp. Referenced by clang::driver::toolchains::HIPToolChain::AddIAMCUIncludeArgs(), and clang::driver::toolchains::CudaToolChain::AddIAMCUIncludeArgs(). addProfileRTLibs - When -fprofile-instr-profile is specified, try to pass a suitable profile runtime library to the linker. Reimplemented in clang::driver::toolchains::Darwin, clang::driver::toolchains::MachO, and clang::driver::toolchains::Linux. Definition at line 674 of file ToolChain.cpp. Referenced by clang::driver::toolchains::Linux::addProfileRTLibs(), clang::driver::tools::fuchsia::Linker::ConstructJob(), clang::driver::tools::MinGW::Linker::ConstructJob(), clang::driver::tools::netbsd::Linker::ConstructJob(), and clang::driver::tools::freebsd::Linker::ConstructJob(). Utility function to add a system include directory to CC1 arguments. Definition at line 746 of file ToolChain.cpp. Referenced by clang::driver::toolchains::BareMetal::AddClangCXXStdlibIncludeArgs(), clang::driver::toolchains::CrossWindowsToolChain::AddClangCXXStdlibIncludeArgs(), clang::driver::toolchains::MinGW::AddClangCXXStdlibIncludeArgs(), clang::driver::toolchains::Fuchsia::AddClangCXXStdlibIncludeArgs(), clang::driver::toolchains::DarwinClang::AddClangCXXStdlibIncludeArgs(), clang::driver::toolchains::Hurd::AddClangSystemIncludeArgs(), clang::driver::toolchains::Linux::AddClangSystemIncludeArgs(), clang::driver::toolchains::MipsLLVMToolChain::AddClangSystemIncludeArgs(), clang::driver::toolchains::RISCVToolChain::AddClangSystemIncludeArgs(), clang::driver::toolchains::MSP430ToolChain::AddClangSystemIncludeArgs(), clang::driver::toolchains::BareMetal::AddClangSystemIncludeArgs(), clang::driver::toolchains::NaClToolChain::AddClangSystemIncludeArgs(), clang::driver::toolchains::Solaris::AddClangSystemIncludeArgs(), clang::driver::toolchains::CrossWindowsToolChain::AddClangSystemIncludeArgs(), clang::driver::toolchains::MinGW::AddClangSystemIncludeArgs(), clang::driver::toolchains::MyriadToolChain::AddClangSystemIncludeArgs(), clang::driver::toolchains::Fuchsia::AddClangSystemIncludeArgs(), clang::driver::toolchains::MSVCToolChain::AddClangSystemIncludeArgs(), clang::driver::toolchains::Haiku::addLibCxxIncludePaths(), clang::driver::toolchains::Linux::addLibCxxIncludePaths(), clang::driver::toolchains::CloudABI::addLibCxxIncludePaths(), clang::driver::toolchains::NaClToolChain::addLibCxxIncludePaths(), clang::driver::toolchains::NetBSD::addLibCxxIncludePaths(), clang::driver::toolchains::MyriadToolChain::addLibCxxIncludePaths(), clang::driver::toolchains::Generic_GCC::addLibCxxIncludePaths(), clang::driver::toolchains::Generic_GCC::addLibStdCXXIncludePaths(), and clang::driver::toolchains::MSVCToolChain::AddSystemIncludeWithSubfolder(). Utility function to add a list of system include directories to CC1. Definition at line 776 of file ToolChain.cpp. Referenced by clang::driver::toolchains::XCoreToolChain::AddClangCXXStdlibIncludeArgs(), and clang::driver::toolchains::XCoreToolChain::AddClangSystemIncludeArgs(). Adjust debug information kind considering all passed options. Definition at line 460 of file ToolChain.h. Reimplemented in clang::driver::toolchains::Generic_GCC, clang::driver::toolchains::CudaToolChain, clang::driver::toolchains::MSVCToolChain, clang::driver::toolchains::MachO, clang::driver::toolchains::MinGW, clang::driver::toolchains::PS4CPU, clang::driver::toolchains::NetBSD, clang::driver::toolchains::CrossWindowsToolChain, clang::driver::toolchains::OpenBSD, clang::driver::toolchains::FreeBSD, clang::driver::toolchains::NaClToolChain, clang::driver::toolchains::Solaris, clang::driver::toolchains::HexagonToolChain, clang::driver::toolchains::DragonFly, clang::driver::toolchains::Ananas, clang::driver::toolchains::Minix, clang::driver::toolchains::XCoreToolChain, clang::driver::toolchains::Linux, and clang::driver::toolchains::Hurd. Definition at line 260 of file ToolChain.cpp. Reimplemented in clang::driver::toolchains::Generic_GCC, clang::driver::toolchains::CudaToolChain, clang::driver::toolchains::MSVCToolChain, clang::driver::toolchains::MachO, clang::driver::toolchains::HIPToolChain, clang::driver::toolchains::Fuchsia, clang::driver::toolchains::MyriadToolChain, clang::driver::toolchains::PS4CPU, clang::driver::toolchains::MinGW, clang::driver::toolchains::NetBSD, clang::driver::toolchains::OpenBSD, clang::driver::toolchains::CrossWindowsToolChain, clang::driver::toolchains::FreeBSD, clang::driver::toolchains::NaClToolChain, clang::driver::toolchains::Solaris, clang::driver::toolchains::HexagonToolChain, clang::driver::toolchains::CloudABI, clang::driver::toolchains::DragonFly, clang::driver::toolchains::Ananas, clang::driver::toolchains::Minix, clang::driver::toolchains::XCoreToolChain, clang::driver::toolchains::Linux, clang::driver::toolchains::AMDGPUToolChain, clang::driver::toolchains::MSP430ToolChain, clang::driver::toolchains::Hurd, clang::driver::toolchains::RISCVToolChain, clang::driver::toolchains::BareMetal, clang::driver::toolchains::AVRToolChain, and clang::driver::toolchains::MipsLLVMToolChain. Definition at line 264 of file ToolChain.cpp. Complain if this tool chain doesn't support Objective-C ARC. Definition at line 428 of file ToolChain.h. ComputeEffectiveClangTriple - Return the Clang triple to use for this target, which may take into account the command line arguments. For example, on Darwin the -mmacosx-version-min= command line argument (which sets the deployment target) determines the version in the triple passed to Clang. Reimplemented in clang::driver::toolchains::Darwin, clang::driver::toolchains::MSVCToolChain, clang::driver::toolchains::NaClToolChain, and clang::driver::toolchains::Fuchsia. Definition at line 658 of file ToolChain.cpp. Referenced by clang::driver::Driver::BuildJobsForAction(), clang::driver::toolchains::MSVCToolChain::ComputeEffectiveClangTriple(), and clang::driver::Driver::HandleImmediateArgs(). ComputeLLVMTriple - Return the LLVM target triple to use, after taking command line arguments into account. Definition at line 537 of file ToolChain.cpp. References clang::driver::Driver::Diag(), getArch(), clang::driver::tools::arm::getARMArch(), clang::driver::tools::arm::getARMCPUForMArch(), clang::driver::tools::arm::getARMTargetCPU(), getDriver(), clang::driver::tools::arm::getLLVMArchSuffixForARM(), getTriple(), and getTripleString(). Referenced by clang::driver::toolchains::Fuchsia::ComputeEffectiveClangTriple(), clang::driver::toolchains::NaClToolChain::ComputeEffectiveClangTriple(), clang::driver::toolchains::Darwin::ComputeEffectiveClangTriple(), ComputeEffectiveClangTriple(), and clang::driver::toolchains::Darwin::GetExceptionModel(). On Windows, returns the MSVC compatibility version. Reimplemented in clang::driver::toolchains::CudaToolChain, clang::driver::toolchains::MSVCToolChain, and clang::driver::toolchains::HIPToolChain. Definition at line 906 of file ToolChain.cpp. Referenced by clang::driver::toolchains::HIPToolChain::computeMSVCVersion(), clang::driver::toolchains::MSVCToolChain::computeMSVCVersion(), and clang::driver::toolchains::CudaToolChain::computeMSVCVersion(). Definition at line 209 of file ToolChain.h. Referenced by clang::driver::toolchains::Hurd::AddClangSystemIncludeArgs(), clang::driver::toolchains::NaClToolChain::AddClangSystemIncludeArgs(), clang::driver::toolchains::NaClToolChain::addLibCxxIncludePaths(), clang::driver::toolchains::DarwinClang::AddLinkARCArgs(), clang::driver::toolchains::DarwinClang::AddLinkRuntimeLibArgs(), clang::driver::toolchains::Darwin::addStartObjectFileArgs(), clang::driver::toolchains::NaClToolChain::buildAssembler(), clang::driver::toolchains::HIPToolChain::buildLinker(), CollectArgsForIntegratedAssembler(), ComputeLLVMTriple(), clang::driver::tools::nacltools::Linker::ConstructJob(), clang::driver::tools::MinGW::Linker::ConstructJob(), clang::driver::tools::freebsd::Linker::ConstructJob(), clang::driver::tools::netbsd::Linker::ConstructJob(), clang::driver::tools::openbsd::Linker::ConstructJob(), clang::driver::tools::gnutools::Linker::ConstructJob(), clang::driver::tools::ClangAs::ConstructJob(), getArchNameForCompilerRTLib(), getArchSpecificLibPath(), clang::driver::toolchains::NetBSD::GetDefaultCXXStdlibType(), clang::driver::toolchains::Hurd::getDynamicLinker(), clang::driver::toolchains::Linux::getDynamicLinker(), clang::driver::toolchains::FreeBSD::GetExceptionModel(), clang::driver::toolchains::MinGW::GetExceptionModel(), clang::driver::toolchains::Darwin::GetExceptionModel(), clang::driver::toolchains::MachO::getMachOArchName(), clang::driver::toolchains::MSVCToolChain::getUniversalCRTLibraryPath(), clang::driver::toolchains::MSVCToolChain::getWindowsSDKLibraryPath(), isCrossCompiling(), clang::driver::toolchains::Generic_GCC::IsIntegratedAssemblerDefault(), isNoCommonDefault(), clang::driver::toolchains::CrossWindowsToolChain::isPICDefault(), clang::driver::toolchains::MinGW::isPICDefault(), clang::driver::toolchains::MSVCToolChain::isPICDefault(), clang::driver::toolchains::Generic_GCC::isPICDefault(), clang::driver::toolchains::CrossWindowsToolChain::isPICDefaultForced(), clang::driver::toolchains::MinGW::isPICDefaultForced(), clang::driver::toolchains::MSVCToolChain::isPICDefaultForced(), clang::driver::toolchains::MachO::isPICDefaultForced(), clang::driver::toolchains::Generic_GCC::isPICDefaultForced(), clang::driver::toolchains::CloudABI::isPIEDefault(), clang::driver::toolchains::CrossWindowsToolChain::isPIEDefault(), clang::driver::toolchains::CrossWindowsToolChain::IsUnwindTablesDefault(), clang::driver::toolchains::MinGW::IsUnwindTablesDefault(), clang::driver::toolchains::MSVCToolChain::IsUnwindTablesDefault(), clang::driver::toolchains::MachO::IsUnwindTablesDefault(), clang::driver::toolchains::Generic_GCC::IsUnwindTablesDefault(), parseClangCLEHFlags(), RenderBuiltinOptions(), RenderObjCOptions(), clang::driver::toolchains::MachO::SupportsProfiling(), clang::driver::toolchains::MSVCToolChain::TranslateArgs(), and clang::driver::toolchains::MachO::TranslateArgs(). Definition at line 210 of file ToolChain.h. Referenced by clang::driver::toolchains::BareMetal::AddLinkRuntimeLib(), clang::driver::Driver::BuildJobsForAction(), and clang::driver::tools::nacltools::Linker::ConstructJob(). Definition at line 412 of file ToolChain.cpp. References getArch(), getDriver(), and getOSLibName(). Referenced by clang::driver::tools::isUseSeparateSections(), and ToolChain(). Get the toolchain's aux triple, if it has one. Exactly what the aux triple represents depends on the toolchain, but for example when compiling CUDA code for the GPU, the triple might be NVPTX, while the aux triple is the host (CPU) toolchain, e.g. x86-linux-gnu. Reimplemented in clang::driver::toolchains::CudaToolChain, and clang::driver::toolchains::HIPToolChain. Definition at line 202 of file ToolChain.h. Definition at line 368 of file ToolChain.cpp. References FT_Object, FT_Shared, FT_Static, getArchNameForCompilerRTLib(), getCompilerRTPath(), getLibraryPaths(), getTriple(), getVFS(), and P.
Referenced by clang::driver::SanitizerArgs::addArgs(), addSanitizerDynamicList(), getCompilerRTArgString(), and clang::driver::Driver::HandleImmediateArgs(). Definition at line 406 of file ToolChain.cpp. Referenced by AddLibgcc(), addProfileRTLibs(), addSanitizerRuntime(), clang::driver::tools::openbsd::Linker::ConstructJob(), and clang::driver::tools::MinGW::Linker::ConstructJob(). Definition at line 358 of file ToolChain.cpp. Referenced by clang::driver::tools::netbsd::Linker::ConstructJob(), getCompilerRT(), and clang::driver::Driver::GetFilePath(). Reimplemented in clang::driver::toolchains::CudaToolChain, clang::driver::toolchains::HIPToolChain, clang::driver::toolchains::HexagonToolChain, clang::driver::toolchains::Fuchsia, clang::driver::toolchains::NaClToolChain, clang::driver::toolchains::CloudABI, and clang::driver::toolchains::MipsLLVMToolChain. Definition at line 727 of file ToolChain.cpp. References CST_Libcxx, CST_Libstdcxx, clang::driver::Driver::Diag(), GetDefaultCXXStdlibType(), and getDriver(). Referenced by clang::driver::toolchains::BareMetal::AddClangCXXStdlibIncludeArgs(), clang::driver::toolchains::CrossWindowsToolChain::AddClangCXXStdlibIncludeArgs(), clang::driver::toolchains::MinGW::AddClangCXXStdlibIncludeArgs(), clang::driver::toolchains::Generic_GCC::AddClangCXXStdlibIncludeArgs(), clang::driver::toolchains::DarwinClang::AddClangCXXStdlibIncludeArgs(), clang::driver::toolchains::BareMetal::AddCXXStdlibLibArgs(), clang::driver::toolchains::FreeBSD::AddCXXStdlibLibArgs(), clang::driver::toolchains::CrossWindowsToolChain::AddCXXStdlibLibArgs(), clang::driver::toolchains::DarwinClang::AddCXXStdlibLibArgs(), AddCXXStdlibLibArgs(), clang::driver::toolchains::HIPToolChain::GetCXXStdlibType(), clang::driver::toolchains::CudaToolChain::GetCXXStdlibType(), RenderObjCOptions(), and clang::driver::toolchains::Darwin::TranslateArgs(). Reimplemented in clang::driver::toolchains::Darwin, clang::driver::toolchains::OpenBSD, clang::driver::toolchains::FreeBSD, clang::driver::toolchains::NetBSD, clang::driver::toolchains::Fuchsia, clang::driver::toolchains::BareMetal, and clang::driver::toolchains::Linux. Definition at line 374 of file ToolChain.h. Get the default debug info format. Typically, this is DWARF. Definition at line 431 of file ToolChain.h. Reimplemented in clang::driver::toolchains::DarwinClang, clang::driver::toolchains::MSVCToolChain, clang::driver::toolchains::PS4CPU, and clang::driver::toolchains::Fuchsia. Definition at line 450 of file ToolChain.h. Reimplemented in clang::driver::toolchains::DarwinClang, clang::driver::toolchains::CudaToolChain, clang::driver::toolchains::HIPToolChain, clang::driver::toolchains::MyriadToolChain, clang::driver::toolchains::OpenBSD, clang::driver::toolchains::FreeBSD, clang::driver::toolchains::Solaris, and clang::driver::toolchains::AMDGPUToolChain. Definition at line 441 of file ToolChain.h. GetDefaultLinker - Get the default linker to use. Reimplemented in clang::driver::toolchains::Fuchsia, clang::driver::toolchains::HexagonToolChain, clang::driver::toolchains::MipsLLVMToolChain, and clang::driver::toolchains::BareMetal. Definition at line 367 of file ToolChain.h. Referenced by clang::driver::tools::wasm::Linker::getLinkerPath(), and GetLinkerPath(). getDefaultObjCRuntime - Return the default Objective-C runtime for this platform. Definition at line 512 of file ToolChain.cpp. GetDefaultRuntimeLibType - Get the default runtime library variant to use. Reimplemented in clang::driver::toolchains::MachO, clang::driver::toolchains::OpenBSD, clang::driver::toolchains::Fuchsia, clang::driver::toolchains::MipsLLVMToolChain, and clang::driver::toolchains::BareMetal. Definition at line 370 of file ToolChain.h. Return sanitizers which are enabled by default. Reimplemented in clang::driver::toolchains::Fuchsia, and clang::driver::toolchains::CloudABI. Definition at line 585 of file ToolChain.h. GetDefaultStackProtectorLevel - Get the default stack protector level for this tool chain (0=off, 1=on, 2=strong, 3=all). Reimplemented in clang::driver::toolchains::Darwin, clang::driver::toolchains::PS4CPU, clang::driver::toolchains::OpenBSD, clang::driver::toolchains::CrossWindowsToolChain, and clang::driver::toolchains::Fuchsia. Definition at line 356 of file ToolChain.h. Reimplemented in clang::driver::toolchains::DarwinClang, and clang::driver::toolchains::FreeBSD. Definition at line 447 of file ToolChain.h. Get the default trivial automatic variable initialization. Definition at line 362 of file ToolChain.h. Provide the default architecture name (as expected by -arch) for this toolchain. Definition at line 229 of file ToolChain.cpp. Referenced by clang::driver::Driver::BuildUniversalActions(), and clang::driver::toolchains::MachO::getMachOArchName(). Definition at line 378 of file ToolChain.h. Definition at line 193 of file ToolChain.h. Referenced by clang::driver::SanitizerArgs::addArgs(), clang::driver::toolchains::DarwinClang::AddCCKextLibArgs(), clang::driver::toolchains::BareMetal::AddClangCXXStdlibIncludeArgs(), clang::driver::toolchains::CrossWindowsToolChain::AddClangCXXStdlibIncludeArgs(), clang::driver::toolchains::Fuchsia::AddClangCXXStdlibIncludeArgs(), clang::driver::toolchains::DarwinClang::AddClangCXXStdlibIncludeArgs(), clang::driver::toolchains::Hurd::AddClangSystemIncludeArgs(), clang::driver::toolchains::Linux::AddClangSystemIncludeArgs(), clang::driver::toolchains::MipsLLVMToolChain::AddClangSystemIncludeArgs(), clang::driver::toolchains::BareMetal::AddClangSystemIncludeArgs(), clang::driver::toolchains::NaClToolChain::AddClangSystemIncludeArgs(), clang::driver::toolchains::Solaris::AddClangSystemIncludeArgs(), clang::driver::toolchains::CrossWindowsToolChain::AddClangSystemIncludeArgs(), clang::driver::toolchains::MinGW::AddClangSystemIncludeArgs(), clang::driver::toolchains::MyriadToolChain::AddClangSystemIncludeArgs(), clang::driver::toolchains::HexagonToolChain::AddClangSystemIncludeArgs(), clang::driver::toolchains::Fuchsia::AddClangSystemIncludeArgs(), clang::driver::toolchains::MSVCToolChain::AddClangSystemIncludeArgs(), clang::driver::toolchains::HIPToolChain::addClangTargetOptions(), clang::driver::toolchains::CudaToolChain::addClangTargetOptions(), clang::driver::toolchains::Haiku::addLibCxxIncludePaths(), clang::driver::toolchains::Linux::addLibCxxIncludePaths(), clang::driver::toolchains::CloudABI::addLibCxxIncludePaths(), clang::driver::toolchains::NaClToolChain::addLibCxxIncludePaths(), clang::driver::toolchains::NetBSD::addLibCxxIncludePaths(), clang::driver::toolchains::MyriadToolChain::addLibCxxIncludePaths(), clang::driver::toolchains::Generic_GCC::addLibCxxIncludePaths(), AddLibgcc(), clang::driver::toolchains::Haiku::addLibStdCxxIncludePaths(), clang::driver::toolchains::Linux::addLibStdCxxIncludePaths(), clang::driver::toolchains::RISCVToolChain::addLibStdCxxIncludePaths(), clang::driver::toolchains::FreeBSD::addLibStdCxxIncludePaths(), clang::driver::toolchains::NetBSD::addLibStdCxxIncludePaths(), clang::driver::toolchains::HexagonToolChain::addLibStdCxxIncludePaths(), clang::driver::toolchains::DarwinClang::AddLinkARCArgs(), clang::driver::toolchains::MachO::AddLinkRuntimeLib(), clang::driver::toolchains::DarwinClang::AddLinkRuntimeLibArgs(), clang::driver::toolchains::Darwin::addStartObjectFileArgs(), clang::driver::tools::ClangAs::AddX86TargetArgs(), clang::driver::toolchains::Ananas::Ananas(), clang::driver::toolchains::BareMetal::BareMetal(), clang::driver::toolchains::MSVCToolChain::buildAssembler(), clang::driver::toolchains::Darwin::CheckObjCARC(), clang::driver::toolchains::CloudABI::CloudABI(), ComputeLLVMTriple(), clang::driver::toolchains::Hurd::computeSysRoot(), clang::driver::toolchains::MipsLLVMToolChain::computeSysRoot(), clang::driver::toolchains::Linux::computeSysRoot(), ConstructGoldLinkJob(), constructHexagonLinkArgs(), clang::driver::tools::wasm::Linker::ConstructJob(), clang::driver::tools::fuchsia::Linker::ConstructJob(), clang::driver::tools::cloudabi::Linker::ConstructJob(), clang::driver::tools::nacltools::Linker::ConstructJob(), clang::driver::tools::MinGW::Linker::ConstructJob(), clang::driver::tools::netbsd::Linker::ConstructJob(), clang::driver::tools::ananas::Linker::ConstructJob(), clang::driver::tools::freebsd::Linker::ConstructJob(), clang::driver::tools::PS4cpu::Link::ConstructJob(), clang::driver::tools::RISCV::Linker::ConstructJob(), clang::driver::tools::msp430::Linker::ConstructJob(), clang::driver::tools::gnutools::Linker::ConstructJob(), clang::driver::tools::ClangAs::ConstructJob(), ConstructPS4LinkJob(), clang::driver::toolchains::CudaToolChain::CudaToolChain(), clang::driver::toolchains::DragonFly::DragonFly(), clang::driver::FallbackCommand::Execute(), clang::driver::toolchains::FreeBSD::FreeBSD(), clang::driver::toolchains::Fuchsia::Fuchsia(), clang::driver::toolchains::Generic_GCC::Generic_GCC(), getArchSpecificLibPath(), clang::driver::toolchains::MipsLLVMToolChain::getCompilerRT(), getCompilerRTPath(), clang::driver::toolchains::MipsLLVMToolChain::GetCXXStdlibType(), clang::driver::toolchains::NaClToolChain::GetCXXStdlibType(), clang::driver::toolchains::Fuchsia::GetCXXStdlibType(), clang::driver::toolchains::HexagonToolChain::GetCXXStdlibType(), GetCXXStdlibType(), clang::driver::toolchains::Linux::getDynamicLinker(), clang::driver::tools::wasm::Linker::getLinkerPath(), GetLinkerPath(), clang::driver::toolchains::Fuchsia::GetRuntimeLibType(), clang::driver::toolchains::DarwinClang::GetRuntimeLibType(), GetRuntimeLibType(), clang::driver::toolchains::BareMetal::getRuntimesDir(), getTargetFeatures(), GetUnwindLibType(), getVFS(), clang::driver::toolchains::HIPToolChain::HIPToolChain(), clang::driver::tools::isUseSeparateSections(), clang::driver::toolchains::MachO::MachO(), clang::driver::toolchains::MinGW::MinGW(), clang::driver::toolchains::Minix::Minix(), clang::driver::toolchains::MSP430ToolChain::MSP430ToolChain(), clang::driver::toolchains::MSVCToolChain::MSVCToolChain(), clang::driver::toolchains::NaClToolChain::NaClToolChain(), clang::driver::toolchains::OpenBSD::OpenBSD(), parseClangCLEHFlags(), clang::driver::toolchains::PS4CPU::PS4CPU(), clang::driver::SanitizerArgs::SanitizerArgs(), SelectTool(), ShouldLinkCXXStdlib(), clang::driver::toolchains::TCEToolChain::TCEToolChain(), clang::driver::toolchains::AMDGPUToolChain::TranslateArgs(), clang::driver::toolchains::MSVCToolChain::TranslateArgs(), clang::driver::toolchains::HIPToolChain::TranslateArgs(), clang::driver::toolchains::CudaToolChain::TranslateArgs(), clang::driver::toolchains::MachO::TranslateArgs(), clang::driver::toolchains::Generic_GCC::TranslateArgs(), clang::driver::toolchains::Darwin::TranslateArgs(), TranslateOpenMPTargetArgs(), clang::driver::tools::arm::useAAPCSForMachO(), clang::driver::XRayArgs::XRayArgs(), and clang::driver::tools::Clang::~Clang(). Get the toolchain's effective clang triple. Definition at line 223 of file ToolChain.h. Referenced by clang::driver::tools::netbsd::Linker::ConstructJob(), clang::driver::tools::ClangAs::ConstructJob(), clang::driver::tools::isUseSeparateSections(), RenderSSPOptions(), and clang::driver::tools::arm::useAAPCSForMachO(). GetExceptionModel - Return the tool chain exception model. Reimplemented in clang::driver::toolchains::Darwin, clang::driver::toolchains::MachO, clang::driver::toolchains::NetBSD, clang::driver::toolchains::MinGW, and clang::driver::toolchains::FreeBSD. Definition at line 518 of file ToolChain.cpp. Definition at line 448 of file ToolChain.cpp. Referenced by AddFastMathRuntimeIfAvailable(), clang::driver::toolchains::Darwin::addStartObjectFileArgs(), ConstructGoldLinkJob(), constructHexagonLinkArgs(), clang::driver::tools::fuchsia::Linker::ConstructJob(), clang::driver::tools::wasm::Linker::ConstructJob(), clang::driver::tools::cloudabi::Linker::ConstructJob(), clang::driver::tools::nacltools::Linker::ConstructJob(), clang::driver::tools::openbsd::Linker::ConstructJob(), clang::driver::tools::freebsd::Linker::ConstructJob(), clang::driver::tools::ananas::Linker::ConstructJob(), clang::driver::tools::netbsd::Linker::ConstructJob(), clang::driver::tools::MinGW::Linker::ConstructJob(), clang::driver::tools::RISCV::Linker::ConstructJob(), clang::driver::tools::msp430::Linker::ConstructJob(), clang::driver::tools::gnutools::Linker::ConstructJob(), and clang::driver::toolchains::NaClToolChain::NaClToolChain(). Definition at line 231 of file ToolChain.h. Referenced by AddFilePathLibArgs(), clang::driver::toolchains::Ananas::Ananas(), clang::driver::toolchains::CloudABI::CloudABI(), constructHexagonLinkArgs(), clang::driver::toolchains::DragonFly::DragonFly(), clang::driver::toolchains::FreeBSD::FreeBSD(), clang::driver::toolchains::Fuchsia::Fuchsia(), clang::driver::Driver::GetFilePath(), clang::driver::Driver::HandleImmediateArgs(), clang::driver::toolchains::HexagonToolChain::HexagonToolChain(), clang::driver::toolchains::MinGW::MinGW(), clang::driver::toolchains::Minix::Minix(), clang::driver::toolchains::MipsLLVMToolChain::MipsLLVMToolChain(), clang::driver::toolchains::MSP430ToolChain::MSP430ToolChain(), clang::driver::toolchains::MyriadToolChain::MyriadToolChain(), clang::driver::toolchains::NaClToolChain::NaClToolChain(), clang::driver::toolchains::NetBSD::NetBSD(), clang::driver::toolchains::OpenBSD::OpenBSD(), clang::driver::toolchains::PS4CPU::PS4CPU(), clang::driver::toolchains::RISCVToolChain::RISCVToolChain(), and ToolChain(). Definition at line 232 of file ToolChain.h. Some toolchains need to modify the file name, for example to replace the extension for object files with .cubin for OpenMP offloading to Nvidia GPUs. Definition at line 246 of file ToolChain.cpp. Referenced by clang::driver::tools::OffloadBundler::ConstructJob(), and clang::driver::toolchains::CudaToolChain::getInputFilename(). Definition at line 228 of file ToolChain.h. Referenced by AddFilePathLibArgs(), addSanitizerLibPath(), getCompilerRT(), clang::driver::Driver::GetFilePath(), and ToolChain(). Definition at line 229 of file ToolChain.h. Returns the linker path, respecting the -fuse-ld= argument to determine the linker suffix or name. Definition at line 456 of file ToolChain.cpp. References clang::driver::Driver::Diag(), getDefaultLinker(), getDriver(), and GetProgramPath(). Referenced by clang::driver::tools::fuchsia::Linker::ConstructJob(), clang::driver::tools::cloudabi::Linker::ConstructJob(), clang::driver::tools::nacltools::Linker::ConstructJob(), clang::driver::tools::ananas::Linker::ConstructJob(), clang::driver::tools::MinGW::Linker::ConstructJob(), clang::driver::tools::openbsd::Linker::ConstructJob(), clang::driver::tools::netbsd::Linker::ConstructJob(), and clang::driver::tools::gnutools::Linker::ConstructJob(). Definition at line 239 of file ToolChain.h. Definition at line 237 of file ToolChain.h. Definition at line 212 of file ToolChain.h. Referenced by clang::driver::toolchains::MipsLLVMToolChain::getCompilerRT(), and getOSLibName(). Definition at line 343 of file ToolChain.cpp. Referenced by getArchSpecificLibPath(), and getCompilerRTPath(). Definition at line 211 of file ToolChain.h. Definition at line 452 of file ToolChain.cpp. Referenced by ConstructGoldLinkJob(), clang::driver::tools::msp430::Linker::ConstructJob(), ConstructPS4LinkJob(), clang::driver::tools::wasm::Linker::getLinkerPath(), and GetLinkerPath(). Definition at line 234 of file ToolChain.h. Referenced by clang::driver::toolchains::BareMetal::BareMetal(), clang::driver::toolchains::CudaToolChain::CudaToolChain(), clang::driver::toolchains::DragonFly::DragonFly(), clang::driver::toolchains::Fuchsia::Fuchsia(), clang::driver::toolchains::Generic_GCC::Generic_GCC(), clang::driver::Driver::HandleImmediateArgs(), clang::driver::toolchains::HexagonToolChain::HexagonToolChain(), clang::driver::toolchains::HIPToolChain::HIPToolChain(), clang::driver::toolchains::Linux::Linux(), clang::driver::toolchains::MachO::MachO(), clang::driver::toolchains::MinGW::MinGW(), clang::driver::toolchains::MSP430ToolChain::MSP430ToolChain(), clang::driver::toolchains::MSVCToolChain::MSVCToolChain(), clang::driver::toolchains::NaClToolChain::NaClToolChain(), clang::driver::toolchains::RISCVToolChain::RISCVToolChain(), and clang::driver::toolchains::TCEToolChain::TCEToolChain(). Definition at line 235 of file ToolChain.h. Definition at line 246 of file ToolChain.h. Definition at line 249 of file ToolChain.h. Reimplemented in clang::driver::toolchains::DarwinClang, and clang::driver::toolchains::Fuchsia. Definition at line 681 of file ToolChain.cpp. References clang::driver::Driver::Diag(), GetDefaultRuntimeLibType(), getDriver(), RLT_CompilerRT, and RLT_Libgcc. Referenced by clang::driver::toolchains::MinGW::AddClangSystemIncludeArgs(), AddLibgcc(), GetUnwindLibType(), and clang::driver::Driver::HandleImmediateArgs(). Definition at line 119 of file ToolChain.cpp. Referenced by clang::driver::toolchains::NetBSD::addClangTargetOptions(), clang::driver::toolchains::DarwinClang::AddLinkRuntimeLibArgs(), AddPS4SanitizerArgs(), addSanitizerLibPath(), collectSanitizerRuntimes(), clang::driver::tools::fuchsia::Linker::ConstructJob(), clang::driver::tools::netbsd::Linker::ConstructJob(), clang::driver::tools::MinGW::Linker::ConstructJob(), clang::driver::toolchains::Linux::isPIEDefault(), and clang::driver::toolchains::FreeBSD::isPIEDefault(). Return sanitizers which are available in this toolchain. Reimplemented in clang::driver::toolchains::Darwin, clang::driver::toolchains::CudaToolChain, clang::driver::toolchains::MSVCToolChain, clang::driver::toolchains::HIPToolChain, clang::driver::toolchains::MyriadToolChain, clang::driver::toolchains::PS4CPU, clang::driver::toolchains::CrossWindowsToolChain, clang::driver::toolchains::NetBSD, clang::driver::toolchains::OpenBSD, clang::driver::toolchains::FreeBSD, clang::driver::toolchains::Fuchsia, clang::driver::toolchains::MinGW, clang::driver::toolchains::Solaris, clang::driver::toolchains::CloudABI, clang::driver::toolchains::Linux, and clang::driver::toolchains::Contiki. Definition at line 862 of file ToolChain.cpp. Referenced by clang::driver::toolchains::Contiki::getSupportedSanitizers(), clang::driver::toolchains::Linux::getSupportedSanitizers(), clang::driver::toolchains::CloudABI::getSupportedSanitizers(), clang::driver::toolchains::Solaris::getSupportedSanitizers(), clang::driver::toolchains::Fuchsia::getSupportedSanitizers(), clang::driver::toolchains::MinGW::getSupportedSanitizers(), clang::driver::toolchains::FreeBSD::getSupportedSanitizers(), clang::driver::toolchains::CrossWindowsToolChain::getSupportedSanitizers(), clang::driver::toolchains::NetBSD::getSupportedSanitizers(), clang::driver::toolchains::OpenBSD::getSupportedSanitizers(), clang::driver::toolchains::PS4CPU::getSupportedSanitizers(), clang::driver::toolchains::HIPToolChain::getSupportedSanitizers(), clang::driver::toolchains::MSVCToolChain::getSupportedSanitizers(), clang::driver::toolchains::CudaToolChain::getSupportedSanitizers(), clang::driver::toolchains::Darwin::getSupportedSanitizers(), and clang::driver::SanitizerArgs::SanitizerArgs(). Return any implicit target and/or mode flag for an invocation of the compiler driver as ProgName. For example, when called with i686-linux-android-g++, the first element of the return value will be set to "i686-linux-android" and the second will be set to "--driver-mode=g++"`. It is OK if the target name is not registered. In this case the return value contains false in the field TargetIsValid. ProgName The name the Clang driver was invoked with (from, e.g., argv). 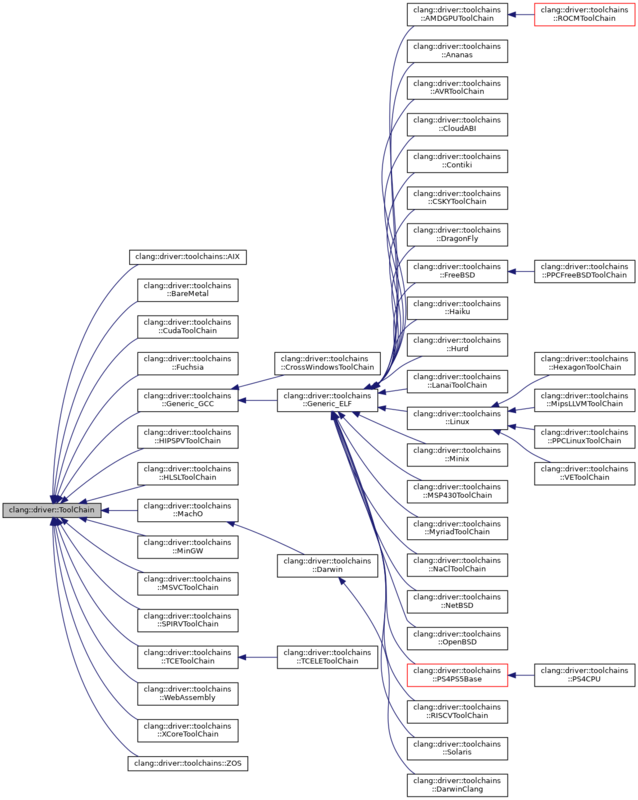 A structure of type ParsedClangName that contains the executable name parts. Definition at line 207 of file ToolChain.cpp. getThreadModel() - Which thread model does this target use? Definition at line 471 of file ToolChain.h. Reimplemented in clang::driver::toolchains::Generic_GCC, clang::driver::toolchains::MachO, and clang::driver::toolchains::MinGW. Definition at line 292 of file ToolChain.cpp. References clang::driver::Action::AnalyzeJobClass, clang::driver::Action::AssembleJobClass, clang::driver::Action::BackendJobClass, clang::driver::Action::BindArchClass, clang::driver::Action::CompileJobClass, clang::driver::Action::DsymutilJobClass, clang::driver::Action::HeaderModulePrecompileJobClass, clang::driver::Action::InputClass, clang::driver::Action::LinkJobClass, clang::driver::Action::LipoJobClass, clang::driver::Action::MigrateJobClass, clang::driver::Action::OffloadBundlingJobClass, clang::driver::Action::OffloadClass, clang::driver::Action::OffloadUnbundlingJobClass, clang::driver::Action::PrecompileJobClass, clang::driver::Action::PreprocessJobClass, clang::driver::Action::VerifyDebugInfoJobClass, and clang::driver::Action::VerifyPCHJobClass. Referenced by clang::driver::toolchains::MinGW::getTool(), clang::driver::toolchains::MachO::getTool(), clang::driver::toolchains::Generic_GCC::getTool(), clang::driver::toolchains::MyriadToolChain::SelectTool(), and SelectTool(). Definition at line 195 of file ToolChain.h. Referenced by clang::driver::SanitizerArgs::addArgs(), clang::driver::toolchains::Hurd::AddClangSystemIncludeArgs(), clang::driver::toolchains::NaClToolChain::AddClangSystemIncludeArgs(), clang::driver::toolchains::Generic_ELF::addClangTargetOptions(), clang::driver::toolchains::DarwinClang::addClangWarningOptions(), addExceptionArgs(), addIncludeLinkerOption(), clang::driver::toolchains::CloudABI::addLibCxxIncludePaths(), clang::driver::toolchains::NaClToolChain::addLibCxxIncludePaths(), AddLibgcc(), clang::driver::toolchains::Haiku::addLibStdCxxIncludePaths(), clang::driver::toolchains::Linux::addLibStdCxxIncludePaths(), clang::driver::toolchains::BareMetal::AddLinkRuntimeLib(), clang::driver::toolchains::DarwinClang::AddLinkRuntimeLibArgs(), clang::driver::tools::ClangAs::AddMIPSTargetArgs(), clang::driver::tools::ClangAs::AddRISCVTargetArgs(), addSanitizerDynamicList(), addSanitizerLibPath(), AddUnwindLibrary(), clang::driver::toolchains::NaClToolChain::buildAssembler(), clang::driver::toolchains::MSVCToolChain::buildAssembler(), clang::driver::Driver::BuildInputs(), clang::driver::Driver::BuildJobs(), clang::driver::Driver::BuildJobsForAction(), clang::driver::toolchains::HIPToolChain::buildLinker(), clang::driver::toolchains::CloudABI::CloudABI(), CollectArgsForIntegratedAssembler(), collectSanitizerRuntimes(), ComputeLLVMTriple(), clang::driver::toolchains::MSVCToolChain::computeMSVCVersion(), clang::driver::toolchains::Linux::computeSysRoot(), clang::driver::tools::visualstudio::Linker::ConstructJob(), clang::driver::tools::netbsd::Linker::ConstructJob(), clang::driver::tools::CrossWindows::Linker::ConstructJob(), clang::driver::tools::freebsd::Linker::ConstructJob(), clang::driver::tools::Myriad::Linker::ConstructJob(), clang::driver::tools::gnutools::Linker::ConstructJob(), clang::driver::tools::ClangAs::ConstructJob(), clang::driver::tools::OffloadBundler::ConstructJob(), clang::driver::Driver::CreateOffloadingDeviceToolChains(), clang::driver::Driver::generateCompilationDiagnostics(), getArchNameForCompilerRTLib(), clang::driver::Compilation::getArgsForToolChain(), clang::driver::toolchains::HIPToolChain::getAuxTriple(), clang::driver::toolchains::CudaToolChain::getAuxTriple(), getCompilerRT(), clang::driver::toolchains::Linux::GetDefaultCXXStdlibType(), clang::driver::toolchains::NetBSD::GetDefaultCXXStdlibType(), clang::driver::toolchains::FreeBSD::GetDefaultCXXStdlibType(), clang::driver::toolchains::Linux::getDynamicLinker(), clang::driver::toolchains::FreeBSD::GetExceptionModel(), clang::driver::toolchains::NetBSD::GetExceptionModel(), clang::driver::toolchains::Darwin::GetExceptionModel(), clang::driver::toolchains::MachO::getMachOArchName(), clang::driver::toolchains::Contiki::getSupportedSanitizers(), clang::driver::toolchains::Linux::getSupportedSanitizers(), clang::driver::toolchains::Solaris::getSupportedSanitizers(), clang::driver::toolchains::FreeBSD::getSupportedSanitizers(), clang::driver::toolchains::NetBSD::getSupportedSanitizers(), clang::driver::toolchains::Darwin::getSupportedSanitizers(), getSupportedSanitizers(), GetTriplePlusArchString(), clang::driver::toolchains::Generic_GCC::IsIntegratedAssemblerDefault(), clang::driver::toolchains::Linux::IsMathErrnoDefault(), clang::driver::toolchains::Linux::isNoExecStackDefault(), clang::driver::toolchains::Generic_GCC::isPICDefault(), clang::driver::toolchains::Generic_GCC::isPICDefaultForced(), clang::driver::toolchains::Linux::isPIEDefault(), clang::driver::toolchains::CloudABI::isPIEDefault(), clang::driver::toolchains::MSVCToolChain::IsUnwindTablesDefault(), clang::driver::tools::isUseSeparateSections(), clang::driver::toolchains::MSP430ToolChain::MSP430ToolChain(), PrintActions1(), clang::driver::SanitizerArgs::SanitizerArgs(), clang::driver::toolchains::MyriadToolChain::SelectTool(), ShouldDisableAutolink(), clang::driver::toolchains::AMDGPUToolChain::TranslateArgs(), clang::driver::XRayArgs::XRayArgs(), and clang::driver::tools::Clang::~Clang(). Definition at line 218 of file ToolChain.h. Referenced by clang::driver::Driver::BuildJobsForAction(), checkDebugInfoOption(), ComputeLLVMTriple(), clang::driver::Driver::HandleImmediateArgs(), and clang::driver::Driver::PrintVersion(). Definition at line 700 of file ToolChain.cpp. References clang::driver::Driver::Diag(), GetDefaultUnwindLibType(), getDriver(), GetRuntimeLibType(), RLT_CompilerRT, RLT_Libgcc, UNW_CompilerRT, UNW_Libgcc, and UNW_None. Definition at line 101 of file ToolChain.cpp. Referenced by clang::driver::toolchains::DarwinClang::AddCCKextLibArgs(), clang::driver::toolchains::BareMetal::AddClangCXXStdlibIncludeArgs(), clang::driver::toolchains::DarwinClang::AddCXXStdlibLibArgs(), clang::driver::toolchains::Linux::addLibCxxIncludePaths(), clang::driver::toolchains::NetBSD::addLibCxxIncludePaths(), clang::driver::toolchains::Generic_GCC::addLibStdCXXIncludePaths(), clang::driver::toolchains::MachO::AddLinkRuntimeLib(), addSanitizerLibPath(), clang::driver::toolchains::Linux::computeSysRoot(), getCompilerRT(), clang::driver::toolchains::Linux::getDynamicLinker(), clang::driver::tools::isUseSeparateSections(), and ToolChain(). Definition at line 125 of file ToolChain.cpp. hasBlocksRuntime - Given that the user is compiling with -fblocks, does this tool chain guarantee the existence of a blocks runtime? Reimplemented in clang::driver::toolchains::Darwin, and clang::driver::toolchains::XCoreToolChain. Definition at line 502 of file ToolChain.h. HasNativeLTOLinker - Check whether the linker and related tools have native LLVM support. Reimplemented in clang::driver::toolchains::MachO, clang::driver::toolchains::PS4CPU, clang::driver::toolchains::MinGW, clang::driver::toolchains::FreeBSD, clang::driver::toolchains::CloudABI, clang::driver::toolchains::Fuchsia, clang::driver::toolchains::Hurd, and clang::driver::toolchains::Linux. Definition at line 492 of file ToolChain.cpp. IsBlocksDefault - Does this tool chain enable -fblocks by default. Definition at line 327 of file ToolChain.h. Returns true if the toolchain is targeting a non-native architecture. Reimplemented in clang::driver::toolchains::Darwin, clang::driver::toolchains::CudaToolChain, clang::driver::toolchains::HIPToolChain, and clang::driver::toolchains::BareMetal. Definition at line 496 of file ToolChain.cpp. IsEncodeExtendedBlockSignatureDefault - Does this tool chain enable -fencode-extended-block-signature by default. Definition at line 341 of file ToolChain.h. IsIntegratedAssemblerDefault - Does this tool chain enable -integrated-as by default. Reimplemented in clang::driver::toolchains::Generic_GCC, clang::driver::toolchains::MachO, clang::driver::toolchains::HexagonToolChain, clang::driver::toolchains::MSVCToolChain, clang::driver::toolchains::NaClToolChain, clang::driver::toolchains::MinGW, clang::driver::toolchains::AMDGPUToolChain, clang::driver::toolchains::CrossWindowsToolChain, clang::driver::toolchains::Fuchsia, clang::driver::toolchains::LanaiToolChain, and clang::driver::toolchains::RISCVToolChain. Definition at line 331 of file ToolChain.h. IsMathErrnoDefault - Does this tool chain use -fmath-errno by default. Reimplemented in clang::driver::toolchains::MachO, clang::driver::toolchains::CudaToolChain, clang::driver::toolchains::HIPToolChain, clang::driver::toolchains::PS4CPU, clang::driver::toolchains::FreeBSD, clang::driver::toolchains::NetBSD, clang::driver::toolchains::OpenBSD, clang::driver::toolchains::DragonFly, clang::driver::toolchains::CloudABI, clang::driver::toolchains::Fuchsia, clang::driver::toolchains::Linux, and clang::driver::toolchains::TCEToolChain. Definition at line 337 of file ToolChain.h. Referenced by clang::driver::toolchains::Linux::IsMathErrnoDefault(), and RenderFloatingPointOptions(). Test whether this toolchaind defaults to non-executable stacks. Definition at line 115 of file ToolChain.cpp. IsObjCNonFragileABIDefault - Does this tool chain set -fobjc-nonfragile-abi by default. Reimplemented in clang::driver::toolchains::MachO, clang::driver::toolchains::PS4CPU, clang::driver::toolchains::FreeBSD, clang::driver::toolchains::NetBSD, clang::driver::toolchains::OpenBSD, and clang::driver::toolchains::CloudABI. Definition at line 345 of file ToolChain.h. Test whether this toolchain defaults to PIC. Implemented in clang::driver::toolchains::Generic_GCC, clang::driver::toolchains::MachO, clang::driver::toolchains::CudaToolChain, clang::driver::toolchains::HIPToolChain, clang::driver::toolchains::MSVCToolChain, clang::driver::toolchains::PS4CPU, clang::driver::toolchains::MinGW, clang::driver::toolchains::XCoreToolChain, clang::driver::toolchains::CrossWindowsToolChain, clang::driver::toolchains::Fuchsia, clang::driver::toolchains::MSP430ToolChain, clang::driver::toolchains::BareMetal, and clang::driver::toolchains::TCEToolChain. Tests whether this toolchain forces its default for PIC, PIE or non-PIC. If this returns true, any PIC related flags should be ignored and instead the results of isPICDefault() and isPIEDefault() are used exclusively. Implemented in clang::driver::toolchains::Generic_GCC, clang::driver::toolchains::MachO, clang::driver::toolchains::CudaToolChain, clang::driver::toolchains::HIPToolChain, clang::driver::toolchains::MSVCToolChain, clang::driver::toolchains::MinGW, clang::driver::toolchains::XCoreToolChain, clang::driver::toolchains::CrossWindowsToolChain, clang::driver::toolchains::Fuchsia, clang::driver::toolchains::MSP430ToolChain, clang::driver::toolchains::BareMetal, and clang::driver::toolchains::TCEToolChain. Test whether this toolchain defaults to PIE. Implemented in clang::driver::toolchains::Generic_GCC, clang::driver::toolchains::MachO, clang::driver::toolchains::CudaToolChain, clang::driver::toolchains::HIPToolChain, clang::driver::toolchains::MSVCToolChain, clang::driver::toolchains::FreeBSD, clang::driver::toolchains::MinGW, clang::driver::toolchains::XCoreToolChain, clang::driver::toolchains::CrossWindowsToolChain, clang::driver::toolchains::OpenBSD, clang::driver::toolchains::CloudABI, clang::driver::toolchains::Fuchsia, clang::driver::toolchains::Linux, clang::driver::toolchains::MSP430ToolChain, clang::driver::toolchains::BareMetal, clang::driver::toolchains::TCEToolChain, and clang::driver::toolchains::Haiku. isThreadModelSupported() - Does this target support a thread model? Definition at line 522 of file ToolChain.cpp. IsUnwindTablesDefault - Does this tool chain use -funwind-tables by default. Reimplemented in clang::driver::toolchains::Generic_GCC, clang::driver::toolchains::MachO, clang::driver::toolchains::MSVCToolChain, clang::driver::toolchains::NetBSD, clang::driver::toolchains::MinGW, clang::driver::toolchains::CrossWindowsToolChain, and clang::driver::toolchains::Fuchsia. Definition at line 250 of file ToolChain.cpp. LookupTypeForExtension - Return the default language type to use for the given extension. Definition at line 488 of file ToolChain.cpp. Returns true if gcov instrumentation (-fprofile-arcs or –coverage) is on. Definition at line 434 of file ToolChain.cpp. Referenced by clang::driver::toolchains::Darwin::addProfileRTLibs(), and needsProfileRT(). needsProfileRT - returns true if instrumentation profile is on. Definition at line 419 of file ToolChain.cpp. Referenced by clang::driver::toolchains::Linux::addProfileRTLibs(), clang::driver::toolchains::Darwin::addProfileRTLibs(), and addProfileRTLibs(). Dispatch to the specific toolchain for verbose printing. This is used when handling the verbose option to print detailed, toolchain-specific information useful for understanding the behavior of the driver on a specific platform. Reimplemented in clang::driver::toolchains::Darwin, clang::driver::toolchains::Generic_GCC, clang::driver::toolchains::MSVCToolChain, and clang::driver::toolchains::MinGW. Definition at line 310 of file ToolChain.h. Choose a tool to use to handle the action JA. This can be overridden when a particular ToolChain needs to use a compiler other than Clang. Definition at line 440 of file ToolChain.cpp. References clang::driver::Action::AssembleJobClass, getDriver(), clang::driver::Action::getKind(), getTool(), and useIntegratedAs(). Referenced by clang::driver::Driver::BuildJobs(), and clang::driver::toolchains::MyriadToolChain::SelectTool(). Definition at line 93 of file ToolChain.cpp. Returns if the C++ standard library should be linked in. Note that e.g. -lm should still be linked even if this returns false. Definition at line 799 of file ToolChain.cpp. Referenced by ConstructGoldLinkJob(), constructHexagonLinkArgs(), clang::driver::tools::wasm::Linker::ConstructJob(), clang::driver::tools::fuchsia::Linker::ConstructJob(), clang::driver::tools::cloudabi::Linker::ConstructJob(), clang::driver::tools::nacltools::Linker::ConstructJob(), clang::driver::tools::netbsd::Linker::ConstructJob(), clang::driver::tools::MinGW::Linker::ConstructJob(), clang::driver::tools::ananas::Linker::ConstructJob(), clang::driver::tools::freebsd::Linker::ConstructJob(), clang::driver::tools::openbsd::Linker::ConstructJob(), clang::driver::tools::RISCV::Linker::ConstructJob(), and clang::driver::tools::gnutools::Linker::ConstructJob(). Does this toolchain supports given debug info option or not. Definition at line 455 of file ToolChain.h. SupportsEmbeddedBitcode - Does this tool chain support embedded bitcode. Definition at line 468 of file ToolChain.h. SupportsProfiling - Does this tool chain support -pg. Reimplemented in clang::driver::toolchains::MachO, clang::driver::toolchains::CudaToolChain, clang::driver::toolchains::HIPToolChain, clang::driver::toolchains::XCoreToolChain, and clang::driver::toolchains::BareMetal. Definition at line 425 of file ToolChain.h. TranslateArgs - Create a new derived argument list for any argument translations this ToolChain may wish to perform, or 0 if no tool chain specific translations are needed. If DeviceOffloadKind is specified the translation specific for that offload kind is performed. BoundArch - The bound architecture name, or 0. DeviceOffloadKind - The device offload kind used for the translation. Reimplemented in clang::driver::toolchains::Darwin, clang::driver::toolchains::Generic_GCC, clang::driver::toolchains::MachO, clang::driver::toolchains::CudaToolChain, clang::driver::toolchains::HIPToolChain, clang::driver::toolchains::MSVCToolChain, and clang::driver::toolchains::AMDGPUToolChain. Definition at line 278 of file ToolChain.h. Referenced by clang::driver::Compilation::getArgsForToolChain(), clang::driver::toolchains::HIPToolChain::TranslateArgs(), and clang::driver::toolchains::CudaToolChain::TranslateArgs(). TranslateOpenMPTargetArgs - Create a new derived argument list for that contains the OpenMP target specific flags passed via -Xopenmp-target -opt=val OR -Xopenmp-target=<triple> -opt=val. Definition at line 946 of file ToolChain.cpp. UseDwarfDebugFlags - Embed the compile options to clang into the Dwarf compile unit information. Definition at line 437 of file ToolChain.h. Check if the toolchain should use the integrated assembler. Reimplemented in clang::driver::toolchains::CudaToolChain, clang::driver::toolchains::HIPToolChain, and clang::driver::toolchains::BareMetal. Definition at line 105 of file ToolChain.cpp. Referenced by SelectTool(), ShouldDisableAutolink(), and ShouldDisableDwarfDirectory(). UseObjCMixedDispatchDefault - When using non-legacy dispatch, should the mixed dispatch method be used? Reimplemented in clang::driver::toolchains::Darwin, and clang::driver::toolchains::MachO. Definition at line 349 of file ToolChain.h. Check whether to enable x86 relax relocations by default. Definition at line 111 of file ToolChain.cpp. Definition at line 116 of file ToolChain.h. Definition at line 159 of file ToolChain.h. Referenced by clang::driver::toolchains::Linux::Linux(), and clang::driver::toolchains::MipsLLVMToolChain::MipsLLVMToolChain(). Definition at line 160 of file ToolChain.h.